The mainstream media propaganda machine struck with a forceful blow at presidential candidate Bernie Sanders. See the size of the letters in the New York Daily News front cover attack. The size of the letters and the headline alone tells a powerful story of the depth and the over-the-top application of the State propaganda we live in today. So not only is no one allowed to question Sandy Hook despite the fact that no part of the event contains any 3-dimensional reality to it and is instead delivered by the words coming out of the mouths of the participants, but even the notion of slowing down the flow of post-Sandy Hook cash flow or questioning the gun control agenda is being attacked as "shameful" by the New York Daily News and the rest of the treasonous CFR (Council on Foreign Relations) driven mainstream media. Yes they do this all the time. The target this time was presidential candidate Bernie Sanders. 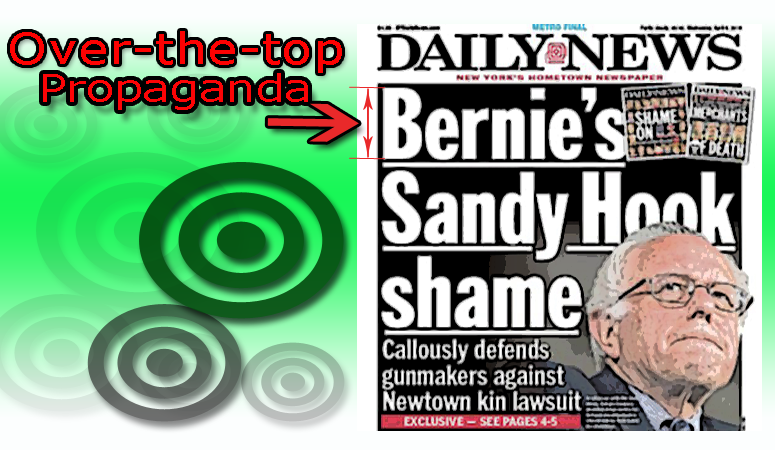 Sanders, who like all the candidates endorses the artificial reality version of the Sandy Hook "story", didn't even question the 2-dimensional version of the story. He only stated that the supposed victims families should not be able to freely sue the gun manufacturers which they shouldn't. Of course we all know this strikes a direct blow to the post Sandy Hook gun control agenda prompting the gatekeeper mainstream media to go on the attack. In summary, the establishment jumped all over Sanders for not going along with both the Sandy Hook "story" AND going along with the post Sandy Hook crisis actor cash flow and subsequent gun control agenda. Apparently supporting just one portion of the Sandy Hook lies is not enough, you must support all phases of the Sandy Hook event or you deserve "shame". I'm sure most readers are not fooled by these tactics. The controllers are not one to miss an opportunity to reinforce their "official stories", especially during a presidential election campaign. And this is exactly what they did as Sanders’ supporter and former Ohio Senator, Nina Turner, is grilled afterwards by MSNBC’s Tamron Hall about the comments. This should remind us that deep behind the curtain of the presidential election campaign is the deep state who ordered the Sandy Hook story to begin with. Like many other truly fraudulent and staged capstone events, Sandy Hook is protected by the mass media state propaganda machine as they are doing here. Everyone should see and feel the large bold letters used by the New York Daily News headline, see it with your minds eye and notice the over-the-top intentional propaganda and ask yourself, is this the world you want to live in? Do you really want to live in a world where this outside artificial force spewing out lies and propaganda actually controls what you think? I don't and I want to call attention to the attack and hope that everyone sees it for what it is. It's State sponsored propaganda and the mainstream media talking heads are the traitors pushing the State propaganda and lies. Not sure of the context? Read history and see for yourself how dictators of the past have controlled the media and the messages sent to their sheep. We are all in the exact same situation only we are too arrogant and too ignorant to acknowledge this. The New York Daily News over-the-top headline demands that you either accept their propaganda or see it for what it is. You must do one or the other. Once you see the size of their letters and see the agenda in play let this be a wake up call. Once you recognize their lies you'll never see this story or any of their "stories" the same again. As already mentioned I call on truth seekers to quickly categorize this story as State propaganda but then it's important to flush it out of your mind. Above and beyond recognizing State propaganda pushed by their CFR approved mainstream media lies however, it is important to mentally live in the new world we (truth seekers and freedom lovers) are creating for ourselves. This is a world I've spoken about before. It's the world where we should imagine that everyone in the planet is awakened. In other words it's time to in a sense tune out the lies and dump out those who are deceived from your worries by imagining they don't exist. I don't mean to ignore the lies all together, we want to acknowledge the delivery of the lie like I'm doing here but intellectually and consciously otherwise ignore the ignorance we are surrounded by as we move forward with our lives. Those who are ignorant are a major resistance force to truth and by keeping them in your mind you are generating an unnecessary self-resistance to the truth in your own life. In our minds we need to live in that world of truth and freedom that in a sense ignores this resistant force and we should not boggle ourselves down with every lie that is told and believed. For example if you personally know that one plus one is equal to two, then all the chatter around you saying that one plus one is three shouldn't even phase you. Your mind should be effectively working and focusing on other things not on the stupidity and distraction around you right? Many people are able to grasp the concept when you frame it this way. In this case, we'll continue exposing the Sandy Hook State sponsored and coordinated event of December 14, 2012. An event they can't prove happened no matter how many law suites they file and how many headlines they weaponize against truth seekers. Everyone should also be aware that the parody Sandy Hook truth website "Honr.info" dedicated as a counter attack site to the Lenny Pozner run "Honr.com" is apparently under attack for frivolous claims of "copyright infringement" which we all know is just a Pozner tactic to stop the truth about Sandy Hook from getting out. This is the much bigger news which serves to remind us that those behind Sandy Hook are criminals desperate to maintain the illusion at any cost. If you agree please help share this message. Bernie is a revolutionary writer with a background in medicine, psychology, and information technology. He is the author of The Art of Overcoming the New World Order and has written numerous articles over the years about freedom, government corruption and conspiracies, and solutions. A former host of the 9/11 Freefall radio show, Bernie is also the creator of the Truth and Art TV project where he shares articles and videos about issues that raise our consciousness and offer solutions to our current problems. His efforts are designed to encourage others to joyfully stand for truth, to expose government tactics of propaganda, fear and deception, and to address the psychology of dealing with the rising new world order. He is also a former U.S. Marine who believes it is our duty to stand for and defend the U.S. Constitution against all enemies foreign and domestic. A peace activist, he believes information and awareness is the first step toward being free from enslavement from the globalist control system which now threatens humanity. He believes love conquers all fear and it is up to each and every one of us to manifest the solutions and the change that you want to see in this world, because doing this is the very thing that will ensure victory and restoration of the human race from the rising global enslavement system, and will offer hope to future generations. If you Enjoyed this article please share! © 2019 Truth and Art TV. All rights reserved.